This is my Learning Sweater. 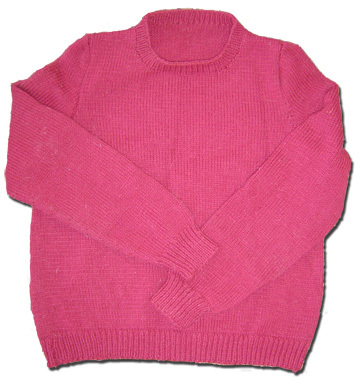 Not only is it the first sweater I ever knit (summer, 2001) it is the first thing I ever knit. The yarn is called No Dye Lot, and the creativity of its name extends to pretty much everything else about it. 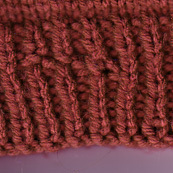 At 100% acrylic, it was singularly unpleasant to knit with, but at the time I didn’t know any better. The three enormous skeins I bought to complete the sweater came to a whopping total of nine bucks. Ribbing. My body does not look good in ribbed edges. Those sleeve cuffs? Yucko. That bottom edge? No way. That collar? The yarn is so dense that the collar actually stands up on its own. Sleeve holes. Raglan sleeves are fine. Drop-shoulders are okay. Sleeve caps? Maybe. But these? These seams don’t know what they want to be. Part raglan, part caps, they inhabit some freakish nether-region where their only neighbors are mutant garments from garage sales. When I last put this on (something you will never see me do) it accentuated my chest in a way that was . . . well, wrong, just wrong! Increases. 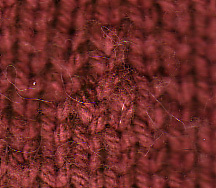 See the way the sweater sort of balloons out just above the ribbing at the waist? And on the sleeves? 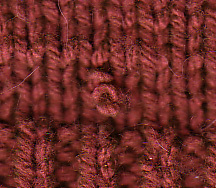 Increases are a common technique when you want part of a garment to be loose while another is snug. This is fine for some people, but it makes me look like an idiot. I’m a skinny guy, so any kind of. . . er, enlargement tends to stand out. Loose-fitting shirts are fine, but puffy sweaters? No, no, and no. The truth is that I knew I’d never wear the sweater in public the moment I finished sewing the last seam. And that moment was a full three and a half months from the afternoon that I cast on the first stitch. I did try the sweater on, but the horror that stared back at me in the mirror only strengthened my conviction. But I’m not the least bit sorry that I knit this sweater. The original question that started this thread was, what inspires me in a sweater design? What draws me to one pattern and not another? Well, I like projects that are long, that require a committment, that present a challenge, that will teach me something that I didn’t know before I started, and whose rewards are complex, enduring, and continually unfolding. This pretty much goes for all of my favorite things: novel writing, long-distance running, being married. I couldn’t have articulated it at the time, but it’s those things that made me choose a sweater as my first real project, why I saw it through to the end, and why I haven’t tossed it into the trash or handed it over to my cat. Oh, I also like to knit things with cables. Lately, anyway. by that i mean ,fearless…not only was this your first sweater, its the first thing you knitted! many men will just go into it, design thier own patterns etc. Yup, I’m doin’ the scarve thing myself now. I’ve moved on to a lace pattern, but it’s still a scarve. I would never have had the guts to start with a sweater. Kudos! I also cannot believe that it turned out as a wearable sweater (I know you said you don’t wear it, but you could). I’m late to the party but I can relate… my first anything was a hat. I screwed it up on the ribbing and it is huge. Only fits the snowman every year. Does keep him plenty warm though.